An echocardiogram is a test that uses sound waves to create pictures of the heart. The picture and information it produces is more detailed than a standard x-ray image. An echocardiogram does not expose you to radiation. 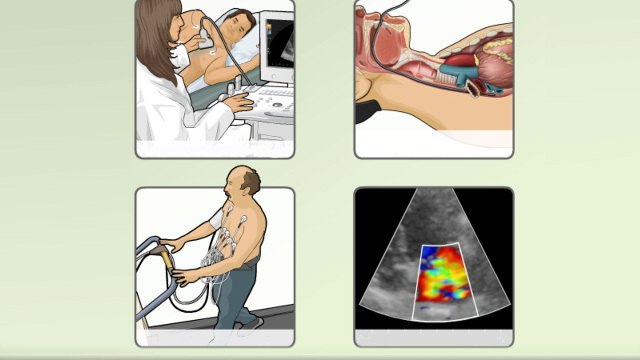 TTE is the type of echocardiogram that most people will have. 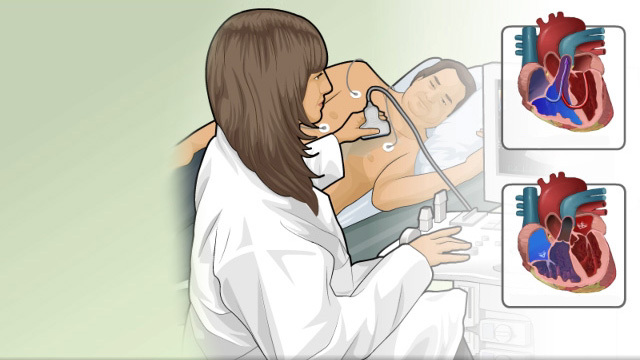 A trained sonographer performs the test. A heart doctor (cardiologist) interprets the results. An instrument called a transducer is placed on various locations on your chest and upper abdomen and directed toward the heart. This device releases high-frequency sound waves. The transducer picks up the echoes of sound waves and transmits them as electrical impulses. The echocardiography machine converts these impulses into moving pictures of the heart. Still pictures are also taken. Pictures can be two-dimensional or three-dimensional. The type of picture will depend on the part of the heart being evaluated and the type of machine. A Doppler echocardiogram evaluates the motion of blood through the heart. An echocardiogram shows the heart while it is beating. It also shows the heart valves and other structures. In some cases, your lungs, ribs, or body tissue may prevent the sound waves and echoes from providing a clear picture of heart function. If this is a problem, the health care provider may inject a small amount of liquid (contrast) through an IV to better see the inside of the heart. Rarely, more invasive testing using special echocardiography probes may be needed. For a TEE, the back of your throat is numbed and a long flexible but firm tube (called a “probe”) which has a small ultrasound transducer at the end is inserted down your throat. A heart doctor with special training will guide the scope down the esophagus and into the stomach. This method is used to get clearer echocardiographic images of your heart. The provider may use this test to look for signs of infection (endocarditis) or blood clots (thrombi). No special steps are needed before a TTE test. If you are having a TEE, you will not be able to eat or drink for several hours before the test. You will need to take off your clothes from the waist up and lie on an exam table on your back. Electrodes will be placed on your chest to monitor your heart beat. A gel is spread on your chest and the transducer will be moved over your skin. You will feel a slight pressure on your chest from the transducer. You may be asked to breathe in a certain way or to roll over onto your left side. Sometimes, a special bed is used to help you stay in the proper position. If you are having a TEE, you will receive some sedating (relaxing) medicines prior to having the probe inserted. The regular (or TTE) is unclear. Unclear results may be due to the shape of your chest, lung disease, or excess body fat. An area of the heart needs to be looked at in more detail. A normal echocardiogram reveals normal heart valves and chambers and normal heart wall movement. An abnormal echocardiogram can mean many things. Some abnormalities are very minor and do not pose major risks. Other abnormalities are signs of serious heart disease. You will need more tests by a specialist in this case. It is very important to talk about the results of your echocardiogram with your provider. There are no known risks from an external TTE test. Reaction to the sedating medicines. Damage to the esophagus. This is more common if you already have a problem with your esophagus. Talk with your provider about the risks associated with this test. This test is used to evaluate and monitor many different heart conditions. Otto CM. Echocardiography. In: Goldman L, Schafer AI, eds. Goldman-Cecil Medicine. 25th ed. Philadelphia, PA: Elsevier Saunders; 2016:chap 55. Solomon SD, Wu J, Gillam L, Bulwer B. Echocardiography. In: Mann DL, Zipes DP, Libby P, Bonow RO, Braunwald E, eds. Braunwald’s Heart Disease: A Textbook of Cardiovascular Medicine. 10th ed. Philadelphia, PA: Elsevier Saunders; 2015:chap 14.